Cessna Caravan of Susi Air just landed at MacArthur in Werur village of Tambrauw regency. These small airplanes were called Cessna Caravan 208 operated by Susi Air. 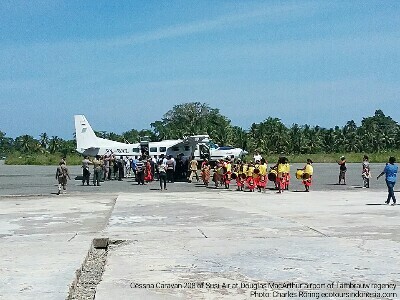 They fly between small airports in Kebar, Sausapor, Numfor, Wasior, and Bintuni and big airports in Manokwari, Sorong, Jayapura and Merauke as well as to other cities in West Papua. Susi Air also serves a lot of remote airstrips in other parts of Indonesia. Cessna Caravan 208 can carry 12 passengers. Every passenger is allowed to carry a maximum 10 kg luggage into the plane. I used to fly between Numfor island and Manokwari city by this aircraft, first with 2 Finish tourists and then with 4 Czech tourists. I also used to fly with 2 Dutch tourists between Merauke city and District Senggo in southern region of West Papua. Although the airplane was very small, it was quite comfortable to fly with. The plane could take off and land on short runways. Several days ago I had an exploratory trip to Tambrauw mountains. 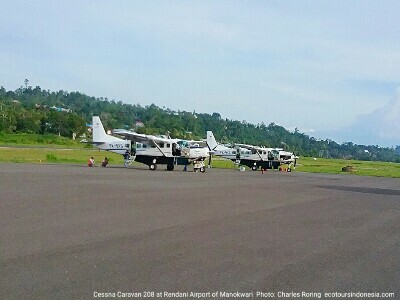 I went there by the small plane from Manokwari to Werur village. The pilots who operated it were foreigners. During the flight the plane passed over the northern coast of the Vogelkop region of West Papua. Compared to jets, the Caravan 208 flew closer to the earth's surface. I could see the terrains, rivers, valkeys and mountain ridges better. It was a pleasant flight. I enjoyed seeing the landscapes views from Manokwari to Tambrauw. There were secluded beaches surrounded by cliffs of high mountains. Another small plane that operates in West Papua is Pilatus Porter PC-06. Unfortunately, according to the official website of the manufacturer, this small plane is not produced anymore.